It’s a small thing, but hey, it might save you some time. The Web application at http://external_url_to_my_site/ could not be found. Verify that you have typed the URL correctly. If the URL should be serving existing content, the system administrator may need to add a new request URL mapping to the intended application. First I tried configuring Search Services (and found some posts on that, such as this one: http://www.anmolrehan-sharepointconsultant.com/2012/01/sharepoint-configuring-foundation.html) and I even contemplated installing Microsoft Search Server 2010 Express (here: http://www.microsoft.com/en-us/download/details.aspx?id=18914). But in the end it was not that complicated. I had to configure Alternate Access Mappings. Here’s how to do that. 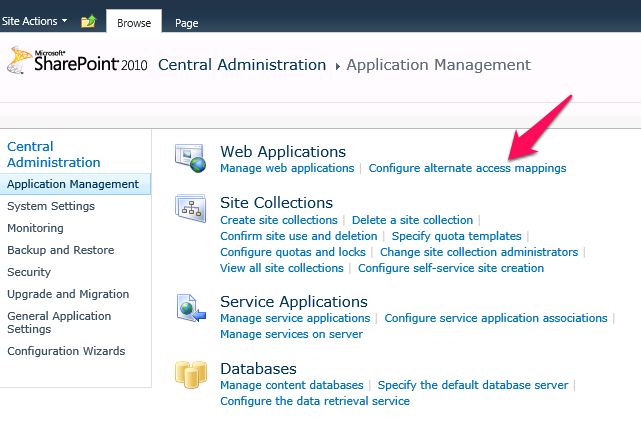 On the server, open the Sharepoint 2010 Central Administration, navigate to Application Management. Under the heading “Web Application” click “Configure alternate access mappings”. Now you can specify the mapping of public urls to internal urls, for different zones in the site. Default, the internal URL is the same as the public URL. Now the trick: choose “Add Internal URLs” and specify the external url in the textbox. Choose “Internet” (or any option but Default) for the zone. One specifying your internal URL (http://local_machine_name/) for zone Default with Public URL http://local_machine_name. The second specifying your external URL (http://www.external_url.com/) for zone Internet with Public URL http://www.external_url.com. That worked for me, although I don’t begin to understand the logic behind this. this also works for your AGOL Organizational account (http://services.arcgis.com/unique_identifier_of_your_organization/arcgis/rest/services). You can check this if you view the URL to the services you’ve published to AGOL. AGOL Online Assistant, for managing AGOL items, such as changing URL in webmaps and copying items between accounts: https://ago-assistant.esri.com/. AGOL Activity Dashboard: http://activitydashboard.arcgis.com/orgusage.html, showing you all kind of stats for your organization. Your account on https://developers.arcgis.com (login first). 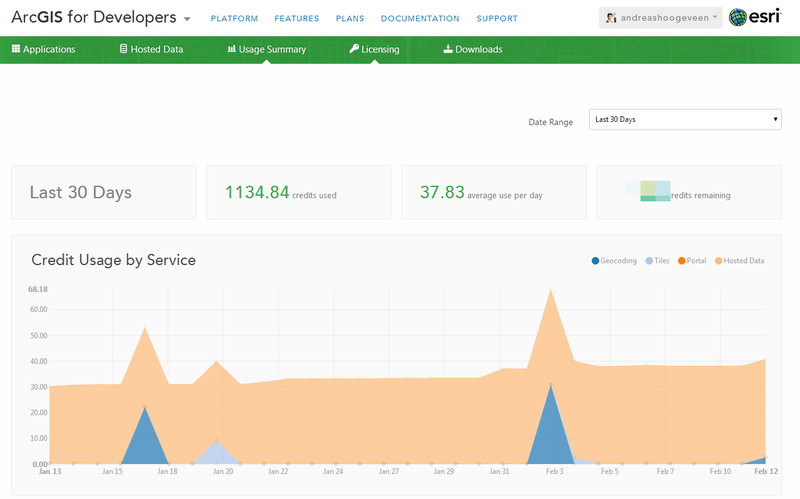 On the top right you can get detailed information on all data, tools, applications, usage etc in AGOL. And if you’re admin four your AGOL Organizational account you can view the stats on http://some_prefix.maps.arcgis.com/home/status.html. Do you have any additions? Leave a comment below!